Tile in homes has become more and more common, and not just in the bathroom and shower areas. Tile and stone floors have become popular surfaces in entry-ways, kitchens, foyers, family rooms, and many other areas, both inside and outside of the home. Tile often seems very easy to clean. After all, you can sweep and mop it occasionally, right? The truth is, tile requires an in-depth cleaning every once in a while. You can probably see the need for a deeper cleaning in discolored tile and grout. 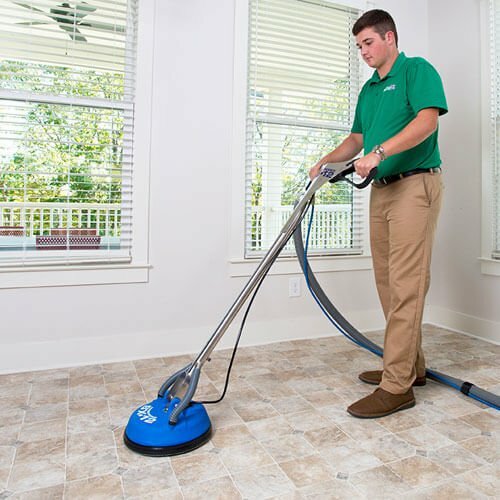 You could get down on your hands and knees with a toothbrush and scrub all of your tile floors, but you probably don’t have the time and energy to put into your floors, and you won’t get the results you would have gotten from a professional tile cleaner. That’s where Temecula Valley Chem-Dry comes in. You can trust that our innovative equipment & cleaning products will make your tile look like it did when it was first installed. Let us save you the time and hassle of cleaning tile and grout and let us take care of it professionally! We are proud to provide our top quality tile and grout cleaning services in Temecula and the surrounding areas. You can trust Temecula Valley Chem-Dry’s tile cleaning service with every tile surface in your home. We understand that there are many types of tile and grout, so call the local cleaning company you can count on to take care of all your tile and grout cleaning needs professionally. Schedule an Appointment with Temecula Valley Chem-Dry! Temecula Valley Chem-Dry offers the driest tile cleaning service in Temecula and the surrounding area. Your tile and grout flooring can be cleaned and sealed on the same day, and freshly cleaned floors can tolerate light traffic in as little as four hours. With our tile cleaning service, you can be back on your floors and living your life in no-time. We work hard to ensure that our services cause the least amount of disruption to your busy schedule and home life while still getting the most effective clean. Just another reason why Temecula Valley Chem-Dry is becoming the popular choice for tile and grout cleaning in Temecula. We aren’t just fast, though. In order to get your tile the cleanest possible, we use a wide variety of powerful cleaning solutions designed to remove soils, oils, buildups, spots, and stains. When that is combined with our high-pressure rinse and extraction process, your tile and grout will be left looking better than it has in years. We take pride in our tile & grout cleaning process areas because it cleans deep and leaves a lasting shine. Cleaner tile means healthier tile. Healthier tile means a healthier home. Our tile and grout cleaners penetrate deeply into the porous surfaces of your tile and grout. This results in removing dirt and helping to eliminate mildew, fungus, bacteria, and other contaminants. Our sealing products also help resist microbial contamination and leave your tile and grout clean, healthy, and happy! We not only provide an excellent tile and grout cleaning process, but we also make sure that these services are performed by a professional whose top priority is your satisfaction. Our technicians have been properly trained, and have the knowledge and experience to professionally evaluate your tile and grout. They will identify your needs and select the proper products, tools, and equipment to deliver a result that will exceed your expectations. Temecula Valley Chem-Dry is dedicated to providing the ultimate tile and grout cleaning service, so contact us today at (951) 200-1977 to get a great deal and set up your tile cleaning appointment today!